Found this weekly meal planner online and I just thought hat this is a great idea to organize those weekly meals. It can be hung right on our kitchen wall for a quick reference guide. I love the fact that menus can be kept and recycled. With this idea, you can make a proper rotation of the menu in a way that it won't be too frequent and follow a nice interval before meals are actually being repeated. Awesome! It pays to plan out meals in advance. Not only it helps us save a great deal of time and effort but it also allows us to do our budgeting easily. If you are a busy Mom, that would also be useful giving your house help an idea on what to prepare for dinner in case you have to be home a little bit late from doing some home errands. Your kids would also have an idea of what to expect for their dinner after school time. 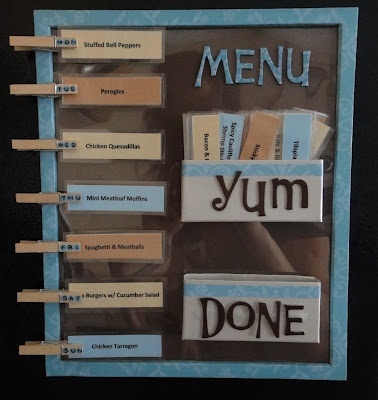 This awesome idea from Claire's ultimate menu board is really a brilliant idea!